Texas Republican Kay Granger and New York Democrat Nita M. Lowey are both vying to become the House Appropriations Committee’s first chairwoman. And while only one of them can claim that title, if the other is named ranking member for the 116th Congress, they would make history together by being the first women to co-lead a standing House committee. It would be a chance for women, who are significantly underrepresented in the House, to run one of the most powerful panels in Congress — determining spending levels and policy on medical research, defense programs, family planning grants, border security and thousands of other line items. On the Democratic side, Lowey has the support of several of her colleagues to become chairwoman, should midterm voters grant Democrats a majority in November. Should they remain the minority party, she’ll likely stay on as ranking member. Granger faces more competition on the Republican side — being one of five panel members seeking the top spot. But if the party loses control of the House during the midterm elections, some of her competitors could withdraw from consideration for ranking member. While Granger and Lowey would be entering new territory, clues to how they would run the panel can be found in the eight years they spent leading the State-Foreign Operations Subcommittee. The two began working together in 2009, when Democrats were in the House majority and Lowey served as chairwoman. But in 2011, Republicans took back the House, and Granger became chairwoman until she moved to the Defense Subcommittee in 2017. The women got along, reaching mutual agreement on some issues, and other times understanding they could not. In those cases, Granger said, the chair made the final decision about spending levels and policy. Along the way, they fostered respect for each other’s policy positions and life experiences and built a friendship that serves as a preview of how they might lead the full committee. That Granger and Lowey are serious contenders to chair a committee that oversees $1.3 trillion in annual discretionary spending is the result of years of work, late-night negotiations and amassing seniority. And like all women in leadership positions, they stand on the shoulders of the women who came before them. The House’s history with female representation and leadership reflects the challenging, slow climb to power for women. A grand total of 328 women have been elected or appointed to Congress, compared with about 12,000 men. And only 23 women have held House gavels dating back to 1923, with none as influential as Appropriations. The House Appropriations Committee has done slightly better in recent decades — even though only 28 women have served on the committee since it began in 1865. The committee now has higher female representation than the full House of Representatives, a trend that has been on the rise since the 1990s, when Lowey and Granger were first elected. 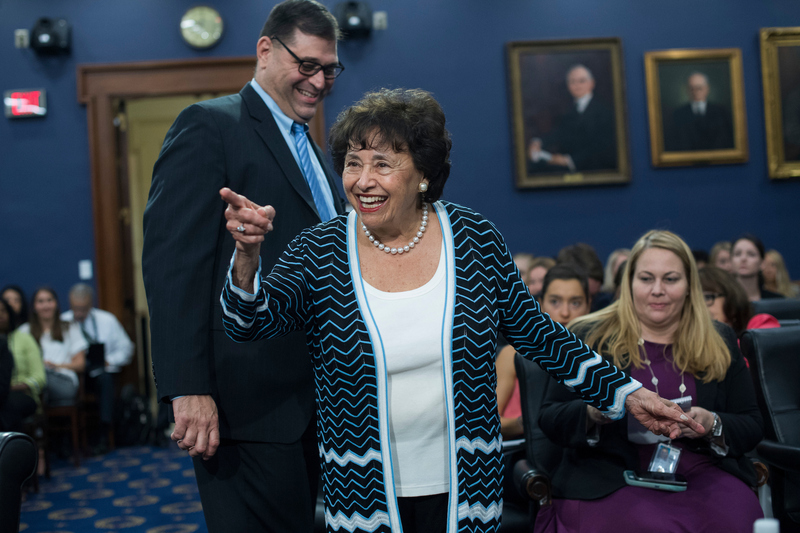 When Lowey joined the committee in 1993, she was one of seven women on a 60-member panel, making up about 12 percent of the House Appropriations Committee, just above the House’s percentage of female voting members. Granger joined the committee in 1999, bringing the number of women on the panel to 10. At the start of the 115th Congress, the number of women on Appropriations had increased to 13, or 25 percent of the panel’s total. Democrats have made clear strides in moving women onto the committee — 10 of their 22 members are women, and Democratic women also hold six of the panel’s 12 ranking member spots on subcommittees — in line with the country’s demographics. Republicans have not made similar progress. GOP women hold only three of their 30 seats, and Granger is the sole Republican female subcommittee chair. Republicans have never had a female ranking member on the full committee. Kahn went on to help establish pensions for Army nurses, voice frustration with the low pay of female government employees and create a program to honor mothers of deceased soldiers. She advocated for women’s involvement in politics and government. And she encouraged Republicans to bring more women into their ranks. “We can’t let the majority be so indifferent that we will be ruled by a minority. Women must be made to realize the importance of their voice,” Kahn said in a 1939 interview. Kahn left Congress in 1936. Another woman wouldn’t be named to the committee until 1963. 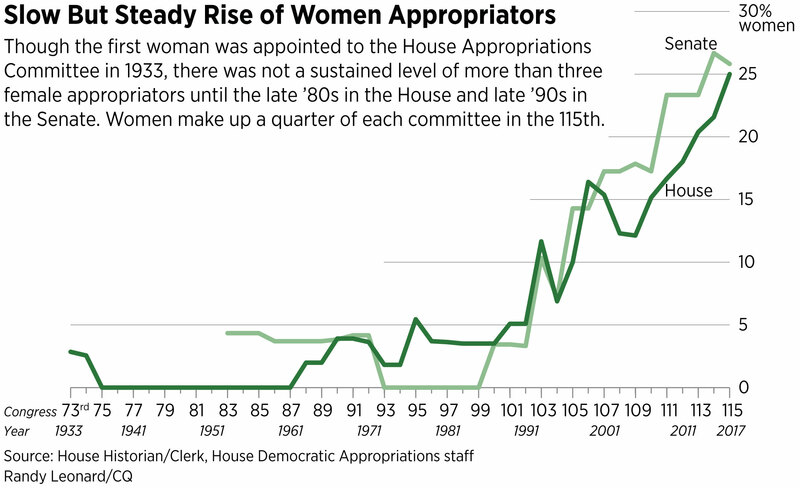 The number of women on the Appropriations Committee remained low through the 1980s as women worked to gain traction in American government. Democrat Marcy Kaptur of Ohio first joined the panel in 1989. The only other women on the 59-member committee were Lindy Boggs, a Louisiana Democrat, and Virginia Smith, a Nebraska Republican. Women also continued to be underrepresented in Congress, with 25 women in the 435-member House and two in the 100-member Senate during the 101st Congress of 1989-90. Kaptur didn’t have an easy time getting named to the committee during her three previous sessions in Congress. During her first hearing, Boggs invited Kaptur to sit with her and explained to her the practices and procedures of the committee. “She adopted me, and I truly appreciate that,” Kaptur said. In the 29 years since, the committee has changed dramatically, Kaptur said, as the number of women grew and as they became their party’s top voice on subcommittees. Two years after Kaptur was first named to the committee, Democrat Nancy Pelosi of California joined. Then, in 1993, a handful of new women, including Lowey and Rosa DeLauro, a Connecticut Democrat, joined the panel, bringing the total number of women to seven out of 60. In her first few years on the committee, DeLauro says that she, Pelosi and Lowey were referred to as the “DeLoSis” (pronounced like “Pelosi”). She said the trio became known for “fighting for women’s health,” including getting women included in clinical trials, establishing a women’s bureau at the National Institutes of Health, directing funding to breast cancer research and advocating for a full range of family planning options. Throughout her time on the committee, women have mastered the policy areas they cover to ensure male colleagues know they belong, DeLauro said. On the Senate side of the Capitol, women’s inclusion in spending decisions and the chamber as a whole followed a similarly slow pace. Maine Republican Margaret Chase Smith became the first woman on the Appropriations Committee in 1953. After her departure from Congress in 1972, the panel returned to a male-only committee until 1987, when Barbara A. Mikulski began a tenure that would eventually make her the Senate’s first appropriations chairwoman. The Maryland Democrat — at the time one of two women in the Senate — said she pursued a seat on Appropriations because it was a “power committee.” She enlisted the help of fellow Marylander Sen. Paul Sarbanes and Massachusetts Sen. Ted Kennedy to earn that spot. And Sen. Robert C. Byrd of West Virginia became her teacher and mentor. Early achievements, she said, included funding for breast cancer research and ensuring that female veterans received the same level of care as male veterans. Mikulski said some men were “more receptive than others” about the policy initiatives of female lawmakers. “I did not ever run into hostility; what I ran into sometimes was an unknowing,” she said. Two other Democratic women, Patty Murray of Washington and Dianne Feinstein of California, joined Mikulski on the committee in 1993. Both carved out areas where they could advance key policy areas important to women. They’ve both witnessed the number of women on the committee rise from three of 29 during the 103rd Congress of 1993-94 to eight of 31 during this session — a bump from 10 percent to 25 percent. When Maine Republican Susan Collins joined the committee in 2009, there were 17 women in the entire Senate, seven of whom were on the Appropriations Committee. Collins says it’s important to have at least one female voice on each panel, because women provide “a perspective that might otherwise be lacking.” But she rebuffed the notion that there are women’s issues. Granger has similar views on her campaign to become the Republicans’ top appropriator. She doesn’t think that having a woman leading the GOP side of the committee would significantly change policy. And she doesn’t want her gender to determine whether or not she gets the position. Regardless of which party is in control during the next Congress, key issues affecting both women and men will be front and center in both chambers come January. Chief among them for appropriators will be negotiating a final two-year spending agreement to avoid a 2011 deficit reduction law lowering spending levels during fiscal 2020 and 2021. And if the House gets a chairwoman and female ranking member on the same panel for the first time in more than 40 years, Granger and Lowey will have far more influence on policy and spending than their predecessors who led the Select Committee on the House Beauty Shop.